Please contact us for an appointment with one of our doctors. Just send an e-mail to info@kaskaloglu.com or call +90532 3766498 and ask for Derya or Dilek. You may visit our website www.kaskaloglu.com for information about our hospital and doctors. 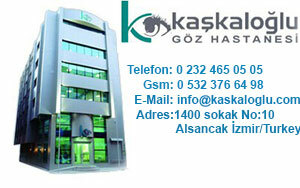 Kaskaloglu Eye Hospital is a modern eye clinic located in Izmir, Turkey. The hospital’s experienced team of surgeons offers quality laser vision correction at affordable prices and is focused on patient satisfaction. Kaskaloglu Eye Hospital specializes in refractive eye surgery, including LASIK with IntraLase and Wavefront correction, an outpatient procedure used to treat common eye problems such as farsightedness, nearsightedness and astigmatism. The hospital’s surgeons also specialize in femtolaser cataract surgery, a relatively quick treatment of a problem that affects about half of people over age 65. All surgeries, including LASIK, LASEK, PRK, ICL, RLE, and cataract and retinal procedures, are performed using only the latest technology and highest quality equipment, such as the IntraLase Femtosecond Laser and the WaveLight ALLEGRETTO WAVE Eye–Q Excimer Laser.